Electroconvulsive therapy (ECT), also known as electroshock therapy, was discovered in 1938 by Italian neuropsychiatrists, Lucio Bini and Ugo Cerletti. ECT is a psychiatric treatment that utilizes electrical currents to generate a seizure in persons with severe mental disorders. ECT has proven effective in many cases when medications failed. ECT has also generated much debate between practitioners, the public, and patients about whether the method is a useful treatment or inhumane torture for the mentally ill. Although the practice of ECT briefly declined in the 1960s, its use has increased in the last 40 years. Nowadays, greater safety precautions coupled with muscle relaxants and anaesthetics better protect patients undergoing ECT treatment. 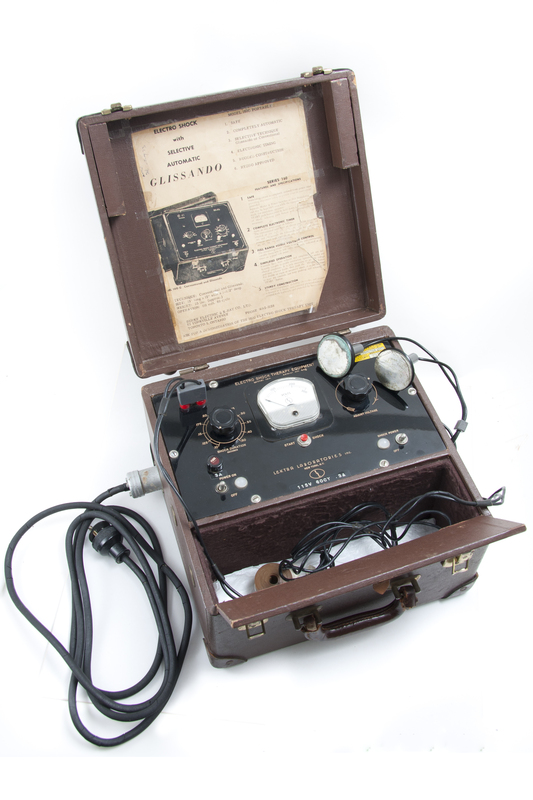 This Lektra Laboratories Series 160 machine was used at the Kingston Psychiatric Hospital in the 1970s. Originally designed in the 1950s, it was easier to operate than earlier units and included improved control, durability, and safety features to protect the patient during treatment.